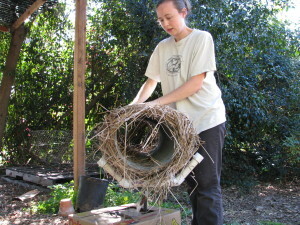 The Finch Frolic Garden Mallard Nesting Tube, by Miranda. 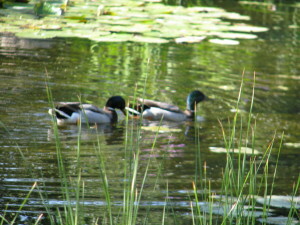 For about four years now a pair of wild mallards have called Finch Frolic Garden home. They visit most of the year, especially in mating season as it is now. The male guards her closely as she goes off to lay an egg a day in some secluded, secret nest. This is Mrs. Mallard’s best time of the year. 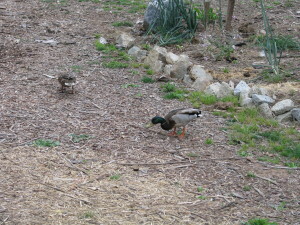 Mrs. Mallard leading her mate all over the property as he protects her. She’ll stroll all over the property while he has to follow, and it is hilarious to watch. They get in more walking time now than in the whole year put together. She deserves to enjoy the attention because the rest of mating season isn’t so much fun for her. The mating occurs in the water, with the male biting her neck and holding her head under water. Ducks have drowned during mating. A couple of years ago Mr. Mallard was losing his mating plumage and decided to allow a rather mean drake have at Mrs. Mallard. It was a violent mating, and she tried hard to get away. Mr. Mallard and his terrible surrogate. The next time the imposter flew in Miranda and I were close to the pond by a lime tree, with some bushes between us and the pond. Suddenly we noticed Mrs. Mallard slowly walking around the bushes, her head held low. If she could have tip-toed with webbed feet she would have. She slowly approached us and hid behind the lime tree next to us. We took action and chased the males away, then spoke soothingly to Mrs. Mallard in a sense of female solidarity. It was quite touching to have a wild creature so trust us as to come to us for rescue. The Mallards checking out the duck island. Once the eggs have been laid the female is entirely in charge of the eggs and the hatchlings. However, if the clutch fails, the male will keep re-mating with her and she’ll keep re-nesting. 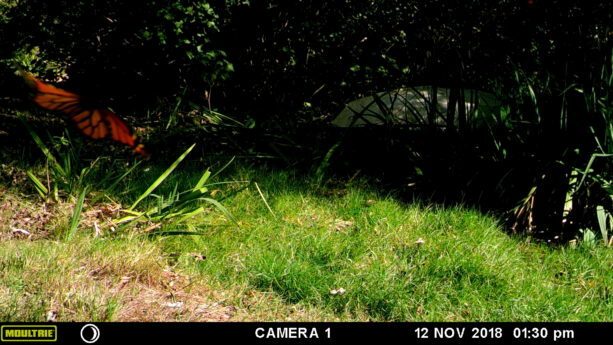 Mrs. Mallard has attempted to lay eggs on our property in the bushes, but rats or other creatures have eaten them. She had a nest right next to our garage one year, perhaps hoping that we could protect the eggs even though by the time we realize why we’d meet a duck on the pathway by the house every day it was too late. 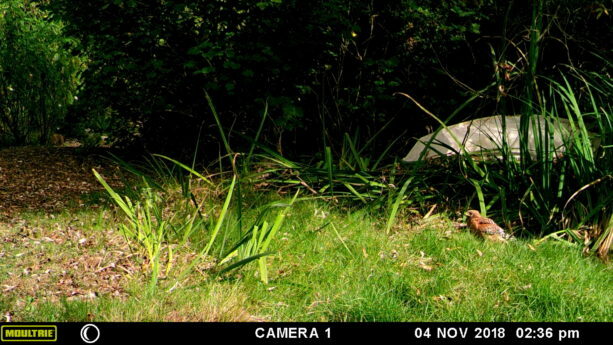 The stress of the mating, the egg production and laying is taxing to a wild duck’s health. 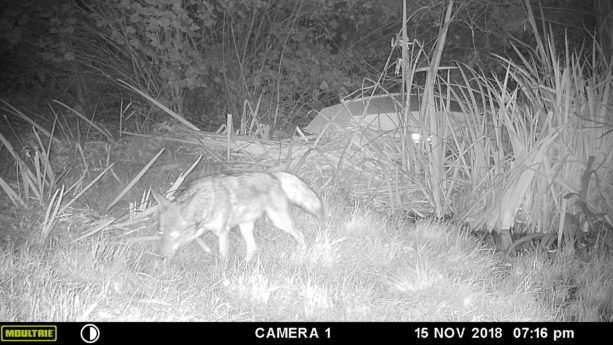 Last year she appeared leading several ducklings to our pond. We have no idea how far she’d lead them, or how many there were to begin with, and we knew the babies probably wouldn’t last long. 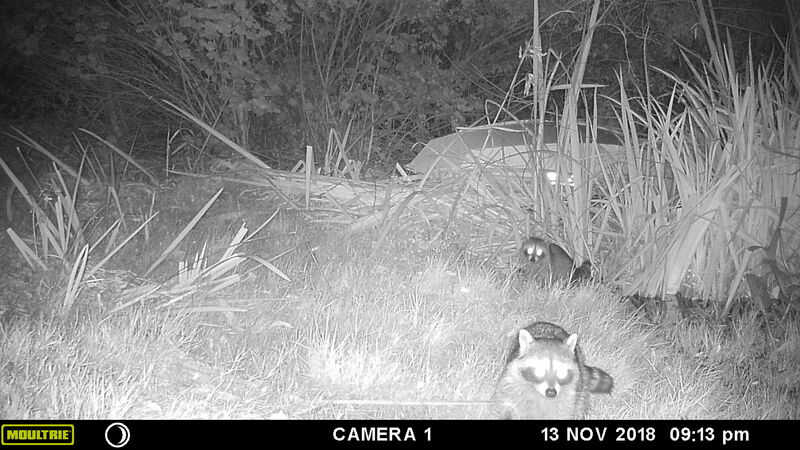 We were right; they were gone by the next day. 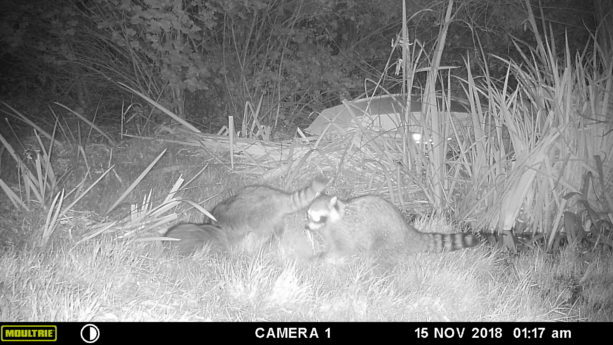 Predation by the invasive bullfrogs in the pond, rats, weasels, hawks or any number of animals. So sad for the mallard family. This year Mrs. Mallard has been disappearing daily, obviously to lay an egg a day elsewhere again. However Miranda decided to help out for future nests. 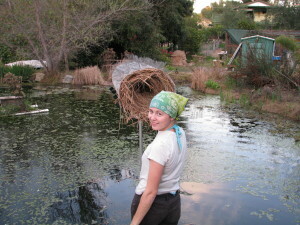 She built a mallard nesting tube. 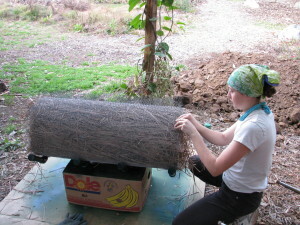 Following instructions she found online from people who have proven this design works, she rolled the first three feet of a piece of 7’x3′ hardware cloth to form a tube. A 7′ x 3′ piece of hardware cloth. 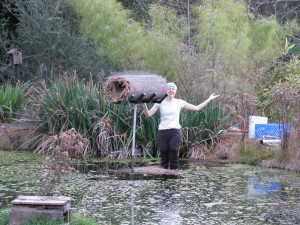 Larger wire would let too much debris fall into the pond. 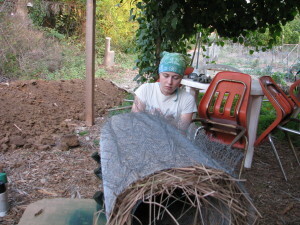 This was wired together, and the last four feet was layered with natural plant materials and rolled. 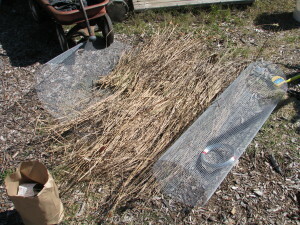 The first 3′ are rolled and fastened, then Miranda lay dry cattails on the rest. 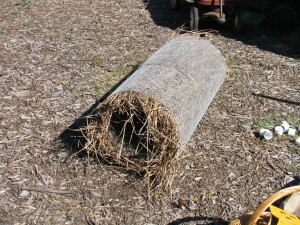 The nesting tube. 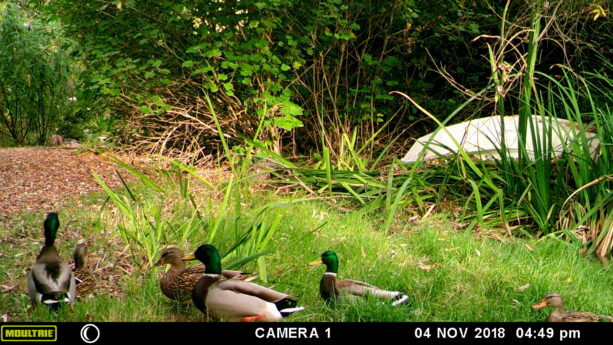 Kind of like a jelly roll for mallards. The inside of the tube isn’t large, but apparently it is large enough. 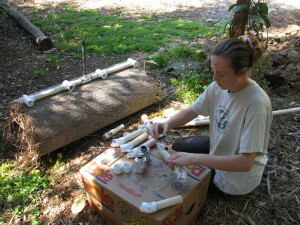 This tube was wired onto a cradle she made mostly of recycled PVC parts, and painted dark green. Gluing together the cradle. All of the pipe we had salvaged from old irrigation systems. The cradle supports the tube, but is also loosely wired onto it. A sprinkler riser is what will fit into the support pipe. Also, to prevent hawks, egrets and other opportunistic birds from perching on top and snacking on eggs or hatchlings, Miranda attached strips of pokey chicken wire along the top. Since egrets visit the pond regularly, the top of the tube had to be inhospitable. 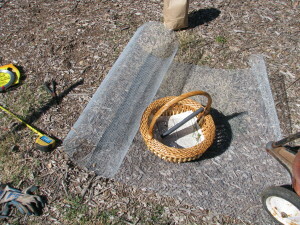 Miranda cut strips of chicken wire and these were bent and wired on top to prevent birds from landing. Slipping into the chilly February pond was a shock until our legs became acclimated (or “numb”). We pounded a hollow pipe, then slipped another pipe into it (both found materials), and then mounted the tube on top. 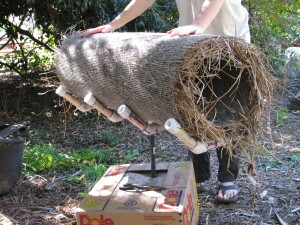 After mounting the nesting tube, Miranda stuffed leaves and dry grass inside, because mallards don’t carry in their own nesting materials. 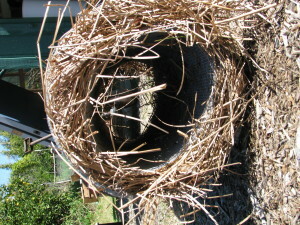 Miranda then lined the inside of the tube with soft nesting materials – dried grass and leaves – because mallards don’t bring them in. A little interior decorating for future lodgers. A sprinkler riser screwed into the PVC cradle slipped into the pipe. 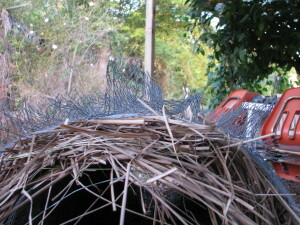 This way the nesting tube can be easily removed for maintenance. The tube is about three feet above the water surface. 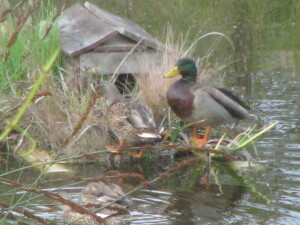 Mrs. Mallard hasn’t shown any interest at this point, but she’s involved with her other nest right now. We have high hopes for a successful nest. Anyone want to come catch bullfrogs?